His baritone barks echoed up the canyon like mournful pleas. They held such sadness and were inflected with such abandonment that for a moment I thought about turning back and scrapping my plans. Instead, I kept skinning up Horse Creek Canyon as his barks slowly faded to a distant, steady pulse. Then the tears came, leaking into the skin track in a steady trickle. I skinned on sobbing hard and heavy, a blubbering mess of a splitboarder pointed in the direction of Matterhorn Peak. The sadness of saying goodbye washed over me in waves. 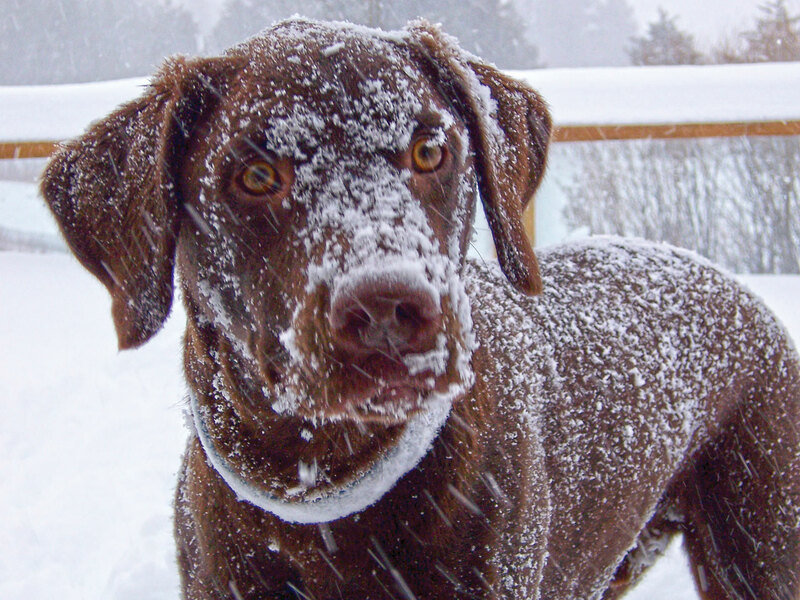 I had already planned a solo backcountry snowboarding trip to the Eastern Sierra when Trevor, my 8-year-old chocolate Lab, came up with a pronounced limp. He refused to put weight on his right front leg, and I worried that in his perpetual over-exuberance, he had suffered a microfracture that might require surgery. A couple days later I was in the veterinarian’s office hearing the words “bone cancer” and the desperate prognosis. I knew I wasn’t going to cancel the Eastern Sierra trip, and I knew I had to take him. But I also knew for the first time ever he’d have to stay in the car. I braced myself for how brutal that was going to be for both of us. I think we both sensed that this would be our last trip down the East Side together—a place we had explored in summer and winter, bonding over snowboard descents, backpacking missions and fishing trips. I hand-fed him half of my In-N-Out burger in a Carson City parking lot, and soon we were back in that majestic peak-studded Highway 395 landscape. Despite years of traversing Tahoe trails and peaks, somehow the wilds of the Eastern Sierra seemed like the most fitting place to say goodbye. A man and his dog share a bond that is almost impossible to describe. It can be as profound as the deepest human friendship. For Trevor and me, it was a spiritual thing, a melding of souls. I know this sounds like hyperbole, but those who have experienced the deep friendship of a dog from puppyhood, who have confronted life’s ups and downs together, know what I mean. We were kindred spirits. We understood each other at a level I have rarely found with another human being. On that trip toward Matterhorn Peak, I was determined to top out on a line that had eluded me on two previous trips—a wide, steep chute named “Ski Dreams” alongside one flank of the peak. I boot-packed up the chute with a group of backcountry skiers I encountered at the base of the line. The ride down, on a thin layer of wind-blown snow covering a near-bulletproof snowpack, produced a level of adrenaline I did not expect. Back at the car, Trevor greeted me with an ecstasy that only dogs can achieve—total uninhibited joy. He limped around the car, alongside Twin Lakes, never straying too far from me, wiggling and whining with excitement and contentment. The next months were a long goodbye. Trevor hung on with incredible strength, much longer than we expected, through the summer and into fall, until it was clear that it was his time to go. My wife and I walked him out to Donner Lake, to the pier in front of the house where he grew up. The water had receded to expose a wide section of beach, and we sat with him and cried. His relentless will to chew sticks and chase anything I threw had not subsided, and he kept walking up to me, pushing slobbery sticks and pinecones into my chest. For a second I considered calling the vet and cancelling the appointment. But I remembered the advice of friends to not wait too long, and when I looked at his leg, and looked into his eyes, I knew it was his powerful will and unnatural drive that would not let him sit down and relax. 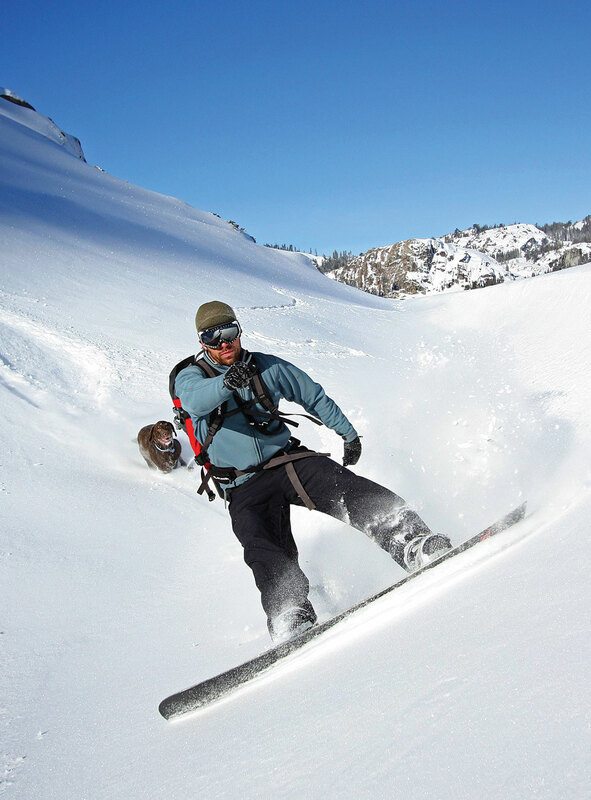 The dog who leapt off cornices to follow me down snowboard lines, who would turn his nose up at mere logs in favor of entire tree trunks as his “stick” of choice, still had that wild spirit burning bright. But I knew it was time for him to go. I buried him in the backyard on a rainy November day. Raindrops, tears and sweat all mingling together as I attacked the soil, digging out the last few inches of a deep grave. No words can describe the absence you feel when you place your dog in the ground. It hurts in the deepest way imaginable. But the hurt is a reflection of the ecstatic, strong love you shared. It hurts so deeply because you loved so deeply. Several weeks later, Mayumi Elegado, the publisher of Moonshine Ink, sent me a link to some photos of puppies up for adoption at the Truckee Humane Society. I did not even want to consider it, but soon I was standing in front of a litter of puppies with my daughter and I knew the decision would be made for me. We picked a light tan puppy, named him Tucker (a phonetic homage to Trevor) and raised him into an admirable Truckee dog. We roll on the floor together like deranged wrestlers, mountain bike and trail run together. I feel a similar bond growing. It will never be the same as the bond I shared with Trevor, but it will be its own beautiful thing. It will grow and expand and enrich both of our lives. Our dogs can teach us a lot of things. One of the lessons I am trying to learn from my canine companion is to love without reservation, to experience moments of ecstasy without inhibition, and to get amped about the most mundane things in life—like a short walk around the block. In many ways I think our dogs’ short lives give them the focus to enjoy and experience things on a level we humans find hard to indulge. For years I’ve struggled to write about Trevor, not because I couldn’t find the words, but because I wondered if readers would find it too indulgent, too hyperbolic. But recently, I’ve come to the opposite opinion. In a world where we spend months obsessing about degenerate politicians, a being like Trevor is worth memorializing. Sometimes the simplest things are the things worth celebrating—the moments we share putting one foot in front of the other in the woods. Trevor experienced these moments in Technicolor. And he brought me along with him in those experiences. For that, I am eternally grateful. That is worth celebrating. 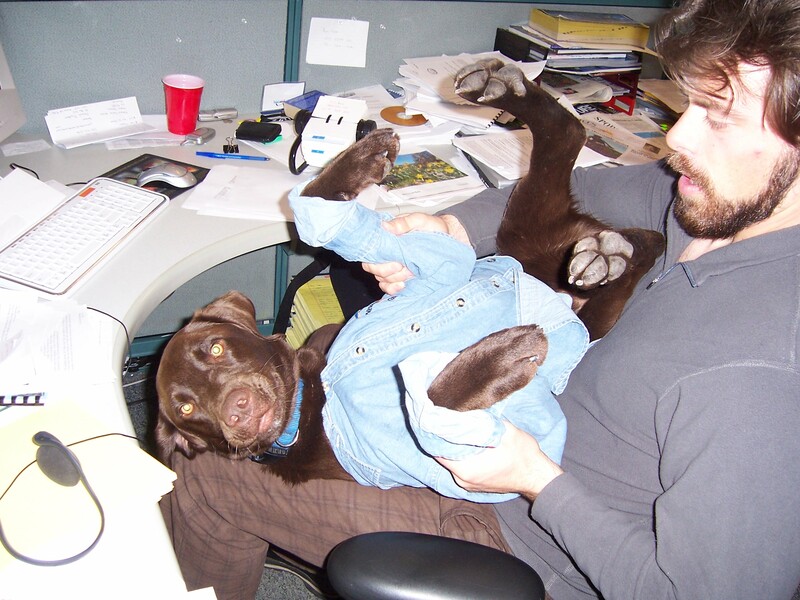 David Bunker is a Truckee-based writer and dog lover. I couldn’t agree more..beautiful tribute ..know the feeling many times over..now, where’s the kleenex? Thank you, David. We have lost three dogs – and it doesn’t get easier. Yes, they are all different and all wonderful in their own way. Thanks for sharing. Puts everything in perspective once again and we need these kinds of stories to remember our humanity!